In early 2016 we decided that it was time to relocate our family to an area with more space. After meeting Robbie and Julie at an open house we knew that they were ideal choice to help us through the sale of our existing home and purchase of a new home. My favorite thing about working with Robbie and Julie is that any time (at any hour) we had a question or concern they seemed to make sure that it was top of their priority list to get us the information we were looking for. The level of communication and responsiveness is exactly what you need in a Realtor. Robbie and Julie got us an accepted offer on the house we wanted and had our house sold within a week of the listing. They did an excellent job of selling our home and getting us the price we needed. I trusted them to navigate us through this seemingly complicated process and they came through for us with a perfect result. 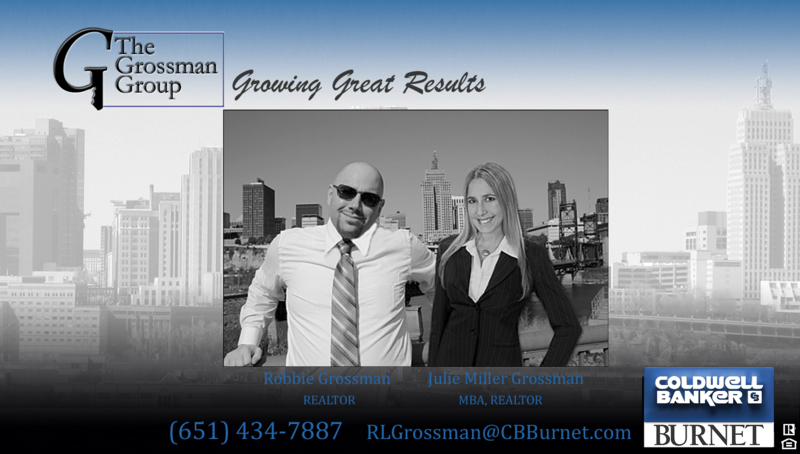 I recommend Robbie and Julie to my friends and family looking to buy or sell in the Twin Cities. We started working with the Grossman Group initially to start getting an idea where we would like to settle down. They were always very patient with us, which is something I didn’t always feel with Realtors in the past. Once we got serious on picking something that would suit our needs, we still ran into some hesitations pulling the trigger, which again we were comforted with their patience. By the time we had found our dream home, we felt very comfortable with the process and exactly what we were looking for. The one we ended up finding had multiple offers within days of hitting the market, and only days to put in a final offer. We were able to not only win the bid, but also feel like we won it with a fair amount. I couldn’t be happier with the outcome, and the Grossman Group took it the extra mile making sure inspections, code requirements, all the little things were taken care of with our offer. The whole process can be a bit overwhelming, and they definitely had some good contacts that also came through for us when needed. We quickly realized finding a home in our price range and location was going to be a very competitive process. After settling with the idea of looking beyond our ideal location, we were able to eventually find actually more than we originally could have hoped for. The Grossman’s availability and effort put into making all the pieces come together, was definitely a major factor with us closing on our dream home. I can whole heartily recommend the Grossman Group as a team that will make it happen. When it comes down to it that is exactly what I was looking for in a Realtor. After a job relocation to the East Coast forced us to prepare and list our home on a very short timeline, Robbie gave us the guidance and support we needed to get on the market quickly. He and his team provided excellent staging advice, and most importantly, priced the home at a level that no other REALTOR® we consulted came close to reaching. Robbie was right. We very quickly had competing offers and ended up accepting an offer above list price – in March. Robbie was responsive, worked hard, advocated on our behalf and got the results we needed on a short timeline that left us with peace of mind and maximum equity. For that we’ll always be thankful. I don’t hesitate to recommend him for anyone in need of a REALTOR®. We first met Robbie at an open house in February 2014, stars in our eyes and dreaming big we took Robbie on a wild goose chase for our dream home: in a popular neighborhood, and during a cutthroat market period where there were three buyers for every house in our range. During this time, Robbie searched for houses relentlessly and got us into places before anyone else knew about them. We dragged him around to look at over 60 houses but Robbie never lost his upbeat attitude and kept us hopeful. Robbie finally found us our home. We would recommend Robbie without any hesitation for too many reasons to list. His attitude, patience and professionalism helped us find much more than just a place to hang our hat. Thank you Robbie. Robbie helped us find an amazing home in an amazing location. He made the home-buying process easy by taking care of us each step of the way. We love our new home and couldn’t be happier!